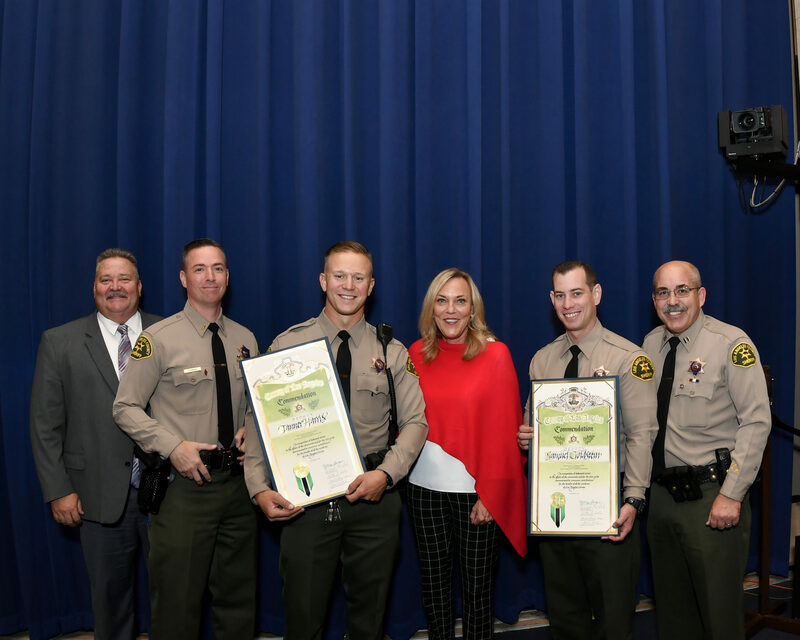 Los Angeles County Supervisor Kathryn Barger recognized two Lancaster Sheriff’s Station deputies who kicked in a door and rescued a man and his toddler son from a burning apartment complex. Barger said deputies Samuel Goldstein and Tanner Harris risked their lives and went “above and beyond” Sept. 19 at the apartment complex near Avenue K-8 and 16th Street West. “While the deputies have insisted they are not heroes and say it was simply another day on the job, I want to personally thank them for their courage and commitment to protecting and serving our community,” Barger said Wednesday during the Board of Supervisors meeting in Los Angeles. The deputies, who were present at the meeting along with Lancaster Sheriff’s Station commander Capt. Todd Weber, downplayed their actions. Harris and Goldstein responded shortly after 4 p.m. Sept. 19 to a report of a structure fire and found several apartments engulfed in flames. As Los Angeles County firefighters battled the flames, fire officials asked for a complete evacuation of the complex. Residents said everyone was outside, but Harris and Goldstein ran up a stairwell to the second floor of the burning building and noticed one door in particular was closed and locked, according to sheriff’s officials. When no one answered their knocks, Harris kicked in the door and Goldstein ran inside. Inside, Goldstein found a startled man standing in the hallway, clearly having just awakened from a nap, officials said. Goldstein ran through the apartment and found a toddler asleep in a room. Goldstein grabbed the child and ran outside with the father. “We are all so grateful for everything that our Los Angeles County Sheriff’s deputies do to keep us safe each day, and especially for these deputies who surpass the call of duty,” Barger said.